Calle de la Fé and Plaza de Lavapiés: a corner I walk by almost every day. The three security screens covering the windows of a recently vacated bank branch look impenetrable. They project an illusion of security, putting up a visible barrier between a private property and an outside. And yet, the solid steel screens are receptive, turned writing and display surfaces by writers, activists and people advertising events. Morning of June 20th: the tags and throws that were there by the end of May, documented here, have been gone over. The new signs on the security screens–throw-ups, equally unauthorized yet tolerated political posters, and commercial ads–display different speeds and different interactions with the older inscriptions, the screens, and the walls. On the first screen, a wildstyle throw-up by GRDNS–yellow, bourdeaux red and black with white and black borders–almost completely covers the tags by Nómada, Exhu, Farlopa, Tumor and others. Interestingly, the colors of the throw echo those of the covered tags. The throw is a dynamic, even electric gesture, possessing, as Gabrielle Gopinath observes, a kinetic energy that make the letters “impossible to ignore” (2016), although the name JONAS is difficult to read. Interestingly, the movement of the throw appears contained within the window frame. It is also flanked by the ghosts of the feminist inscription “MACHETE AL MACHOTE” (DOWN WITH MACHO ATTITUDES) on its left and of several tags on its right: ghosts stubbornly resisting removal efforts by the city hall. The throw by Rodro on the second screen–silver bubble letters with black and white borders on avatar blue splash–also goes over the tags but respects Tosk’s. While Rodro’s throw looks solid, the splash adds movement, overflowing the window frame onto the wall. Rodro also wrote his tag in black aerosol on the wall to the left of his throw. A different use of surfaces, and a different speed, appears with the posters on the third metal screen. 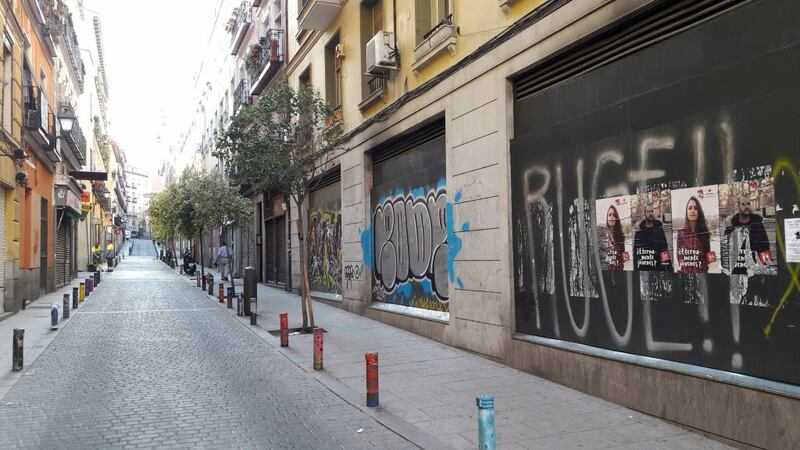 It is arguably the most visible of the three, given its location on the corner with Plaza de Lavapiés, and the one chosen by activists to paste their posters as it potentially reaches a large number of passersby. Posters from the campaign “¿Eternamente Jóvenes?” (Forever Young?) by Izquierda Unida (United Left) were glued in the middle of the last four characters of the RUGE!! (ROAR!!) inscription in silver aerosol that has been there since May. The inscription can still be read clearly, creating a resonance between the exhortation ROAR!! and the spirit of the campaign, which calls young people to take action to “end precariousness, obtain decent housing and stop the emigration of our youth” (IU Press Note). 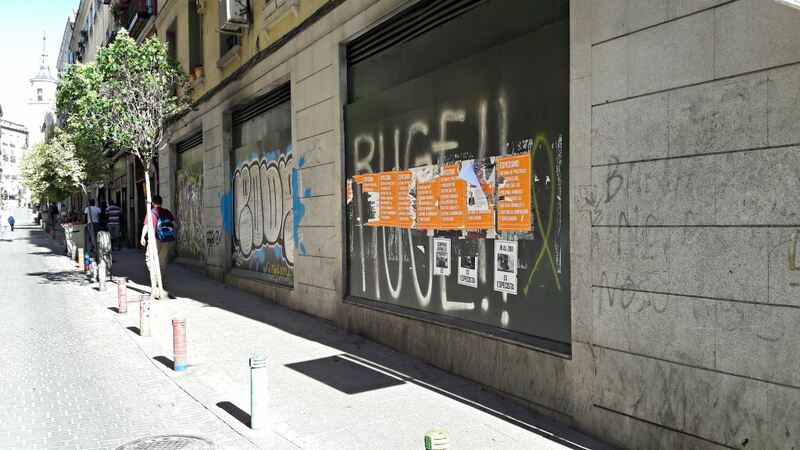 The posters also respected the yellow aerosol ribbon that expresses support for the jailed Catalonian separatist politicians. A white ad for Tai Chi classes, however, partially covers the ribbon. Morning of June 27th: the third metal screen appears partially covered with orange posters put up by activists for animal rights offering a definition of speciesism. Glued below, four fliers with text and images in black and white expose the human speciesist logic of value informing several everyday practices: buying pets, wearing fur, going to the zoo, and conducting animal experiments. 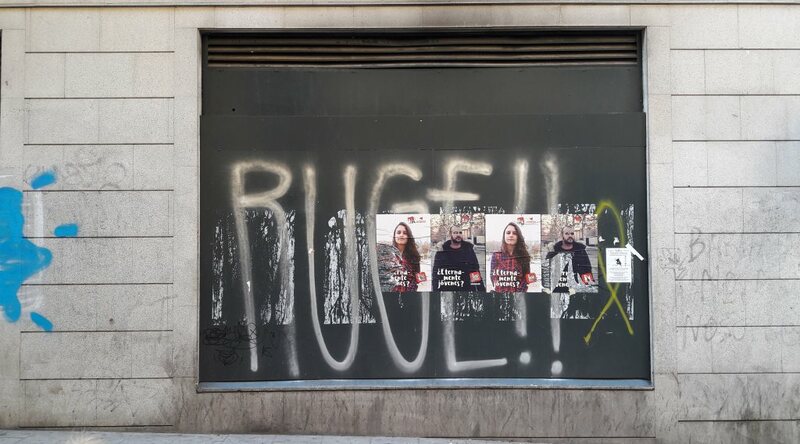 The collective Acabemos con el Especismo glued the orange posters directly on top of the IU posters and right across the center of the full inscription, creating a solid orange row impossible to miss. A solid orange row that respects both the spirit of RUGE! !, which is still clearly legible, and the yellow ribbon. July 3rd, 8:30am: As I walk by the corner on my way to the subway station, I notice three posters adhered on top of the orange ones. One covers the Tai Chi ad. Activists of Lavapiés ¿Dónde Vas?, the neighborhood collective that organizes local resistance to the home dispossessions taking place in the gentrifying landscape of Lavapiés, invite neighbors to join the action #StopDesahucio #NosQuedamos (Stop Evictions, We Stay) on July 5th. The posters inform about the background of the planned eviction, hoping to bring neighbors out to Argumosa 11, to join efforts to stop the eviction of three families by Inversión en Proindivisos. The anti-eviction action is supported by PAH Centro de Madrid (Platform for People Affected by Mortgages born in 2011) and Sindicato de inquilinas e inquilinos (Madrid’s Tenants’ Union, born in 2017) and as such is part of several citizen responses against the urban dispossessions of global real estate. July 3rd, 6:30pm: Walking home after work. Security screens in a vacant bank branch on the corner of Calle de la Fé and Plaza de Lavapiés. Screens activated as communicative surfaces by graffiti writers, activists, passersby: unauthorized throws and posters claiming the screens, uninvited pictures documenting the coexistence of unofficial stories being written on, and erased from, the walls. The surfaces of cities, proposes architectural historian Sabina Andron, are “worlds of political discourse.” Graffiti writing, observes sociologist Andrea Mubi Brighenti, “creates its own specific way of using walls…transform[ing] the wall into…a part of a continuing conversation” (2010). The same could be argued for postering. In their own ways, these conversations make evident what visual criminologist Alison Young calls “the existence of other cities and their inhabitants” in the legislated city (2014: 151). Madrid, June 20, 27-29, July 3, 2018.